The rugby media around the world have had several days now to digest the news that Danny Cipriani will be one of the star signings for the Melbourne Rebels in their first year in the 2011 Super 15 tournament. But in that time, they have failed to see the real news behind the signing. To give the revelation of the real news of the Cipriani signing a context, we need to go back to a Sherlock Holmes story which involved a dog that did not bark during the night. The signing of Cipriani had been foreshadowed for some weeks before it actually happened. It was no surprise when the announcement was made. But the dog not barking in the night factor was revealed towards the end of a long statement put out by the Melbourne Rebels CEO Brian Waldron announcing the signing. This is the real news on the signing. I think most experts expected that Cipriani would play first five-eighths for the new franchise. The acknowledgment that this won’t be his starting position opens up the intriguing question: Have the Rebels signed up, or virtually signed up, another star player for the crucial five-eighths position? You would have to think that the franchise has. Why would they be so adamant that Cipriani, a Test five-eighths, won’t be playing in the position that most experts think is his best if the real five-eighths hasn’t been put into place? The Rebels have encouraged the ARU to move forward the date the franchise can officially sign up players from rival Australian teams to March 15. They can still announce overseas players before then. The fact that the franchise has not suggests that the five-eighths will be someone now playing in Australia. The other possibility is Berrick Barnes. He has a one-year contract with the NSW Waratahs. He is the type of player (disciplined, steady and smart) that Macqueen likes. He would fit into the culture of making “a positive contribution to the Melbourne community and the rugby game” that the Rebels are trying to create. High ranking rugby officials have told me that Barnes is a future Wallaby captain. He was made a vice-captain last year, much to the consternation of Matt Giteau. So he must be the favourite for the first-five eighths leadership role with the Rebels. There is one other possibility (slightly left field, I know) I’d throw in, however. Sterling Mortlock is known to be on the Rebels wish list, along with Rocky Elsom (the Rebels equivalent of the ACT Brumbies Owen Finegan?) and Mark Gasnier. Could Mortlock be the first five-eighth Macqueen is looking for? Macqueen has coached Mortlock for the Brumbies and the Wallabies and clearly has a great regard for his leadership talents. Mortlock has played all his rugby as a winger and in the centres, admittedly. But as he is slowing down in terms of speed, his passing skills seem to have developed quite markedly. His defence, too, in the crucial number one channel off the ruck and maul would be invaluable for a new team. There is a precedent for the conversion. 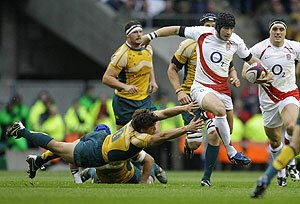 Stephen Larkham played halfback, outside centre and fullback before Macqueen converted him into a five-eighths. Mortlock, I’m sure, could make this transition. And if he doesn’t, the Rebels could always move Cipriani up and Mortlock back to the centres. So the curious case of fullback Danny Cipriani might have thrown up the possible solution in Stirling Mortlock, the first five-eighths. Whether we can say “elementary my dear Roarers,” though, will have to wait until March 15.